Irish low cost airline Ryanair Ltd. announced on Monday that it flew more than 86 million passengers in 2014, while in December it transported 20% more people compared to December 2013, up from 5.02 million to 6.02 million. Ryanair shares today hit an all-time high of €10.06 after December figures were published. The impressive performance came from the Dublin-based carrier raising its capacity by more than 10% compared to December 2013, as well as carrying more passenger per flight. Ryanair’s load factor, i.e. how much of its passenger-carrying capacity was used, reached 88% in December, up from 81% in the same month in 2013. Its rolling annual traffic increased by 6% to 86.4 million passengers. At the beginning of December, Ryanair’s share value exceeded €13 billion, a new record, after it predicted that profits would reach €830 million for the 2014-2015 fiscal year. The company based this forecast on total passenger numbers reaching 90 million for the year ending in March 2015. Today’s announcement triggered share buying by investors, which in turn boosted its total value to more than €14 billion. This means that Michael O’Leary, Ryanair’s CEO, who holds a 3.7% stake in the company, is now worth more than €500 million. 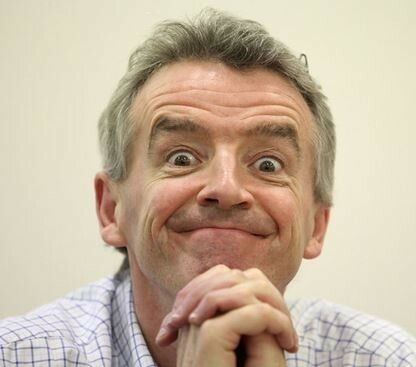 Ryanair’s CEO Michael O’Leary is now worth more than half-a-billion euros. On January 2nd, 2015, Ryanair launched a Crazy Fares sales across Europe, with fares slashed to as low as £9.99 on Tuesdays, Wednesdays and Thursdays in January. Flights must be booked by midnight on January 5th. 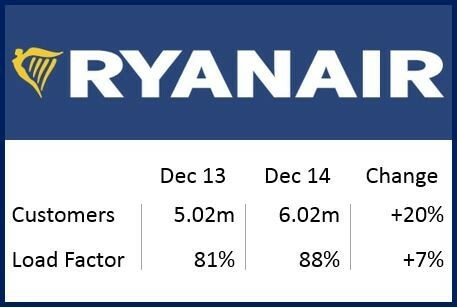 Ryanair has been pushing hard at improving its services for passengers over the past 12 months, as well as increasing capacity. It has got rid of several unpopular choices, allowing more carry-on baggage, and cutting punitive charges. The airline increased the total number of routes over this winter season, concentrating on European short-haul routes for skiers and consumers taking City breaks, as well as business travelers.